Our comprehensive video courses and independent learning modules make teaching for occupational & physical therapy easy. Our comprehensive video courses and independent learning modules make teaching easy. Each video course includes patient treatments, workbooks, practice labs & exams. Assign the entire course or select a specific topic. Great for flipping the classroom. Each supported by video demonstrations and workbook explanations. Extensive content facilitates advanced skills in critical thinking and clinical reasoning. Each online video course is designed as a stand-alone, comprehensive learning module and illustrates a variety of assessment & intervention strategies. Excellent for students. Faculty can assign a video course as is, or use specific segments of a course for in-class or out of class activities. Use all three courses to create an Independent Study course for anyone interested in stroke rehabilitation. Perfect for colleges and universities offering distance-learning programs. Improving Function & Awareness: "Examples of Guiding, Weightbearing & Bilateral Use"
Preventing Shoulder Pain: "Scapular Mobilization: Elevation"
Wheelchair Transfers: "Transfer: Maximum Assistance"
Standing Safely: "Stand to Sit: Moderate Assist"
Bed Positioning & Mobility: "Scooting Side to Side: Therapeutic Method"
Assessment in Acute Care: "Observation of a Patient Assessment"
Intervention In Acute Care: "Patient #2: Calvin"
Intensive Care Unit in Acute Care: "Managing Equipment in the ICU"
Practice Labs for Acute Care: "Scapular Mobilization: Protraction"
Functional Activities: "Functional Activities with Tom"
Functional Activities: "Functional Activities with Clint"
Functional Activities: "Functional Activities with Alice"
Each comprehensive course includes a Student Text & Workbook complete with assignments, practice labs, and access to hours of corresponding streaming patient videos. Subscriptions also include a comprehensive Faculty Guide with tips for teaching Practice Labs and answers to assignments & exams. Click Here for per-student pricing options. Jan Davis demonstrates clear, concise step-by-step handling methods to improve functional mobility and self-care with actual stroke survivors requiring moderate and maximum assistance. More than 40 practice labs are included on Wheelchair Transfers, Self-Care, Preventing Shoulder Pain, Improving Function and Awareness, Standing Safely and Bed Positioning and Mobility. 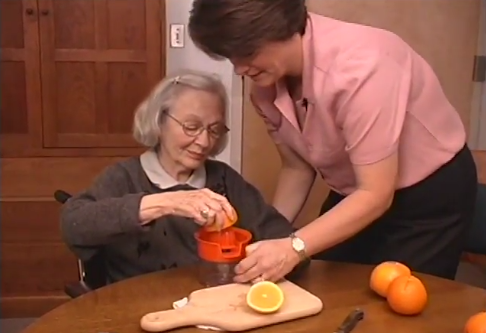 Jan Davis skilfully demonstrates how to use functional activities taken from real-life situations to improve upper extremity and lower extremity function with actual stroke survivors. This program highlights handling methods that can be used in any treatment setting. A must have for every curriculum emphasizing a functional approach to stroke rehabilitation. This program is highly effective in preparing students for their clinical experience in the acute care setting. Excellent guidelines are provided for teaching assessment and intervention strategies with neurologically involved patients in the ICU and acute care hospital. Observe as the medical director leads the stroke team at a nationally certified stroke center of excellence, rated as one of the top 100 hospitals in the nation.